The excellent Alpha series 50, 65 and 80. The extraordinary Shape series 40, 50 and 65. The marvellous SM9, Sub6, Twin6 BE and Trio6 BE. They're all the brainchild of the French company Focal, part of the Focal & Naim Group and the Saint Etienne-based maker of high quality domestic and pro audio speaker systems since 1979. They're the brains behind the legendary Grande Utopia hi-fi speaker, an iconic item that helped cement the company’s reputation, still considered one of the finest hi-fi speakers ever made. 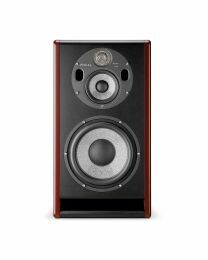 Responsible for the famous polyglass cone in 1988 and the Beryllium tweeter in 2002, their current crop of monitors are some of the best pro active studio monitors available on the market, combining wonderful crystal clarity with high quality performance, stunning sleek design and a surprising level of affordability. Check the range of Focal products we sell below, and feel free to ask our sound-obsessed team if you have any questions.